What do you like to eat for breakfast? I like to eat … for breakfast. 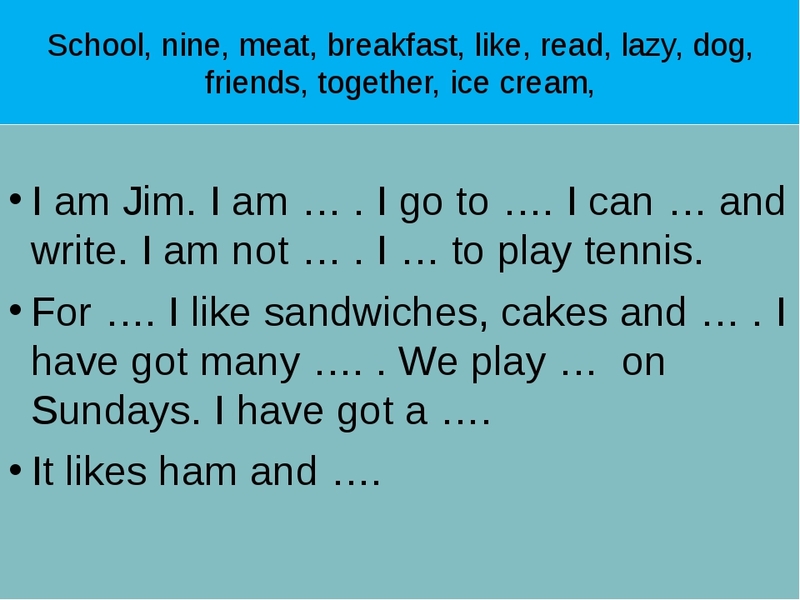 School, nine, meat, breakfast, like, read, lazy, dog, friends, together, ice cream, I am Jim. I am … . I go to …. I can … and write. I am not … . I … to play tennis. For …. I like sandwiches, cakes and … . I have got many …. . We play … on Sundays. I have got a …. It likes ham and …. Must - ДОЛЖЕН I think you must …..
Цели: активизация орфографических навыков; тренировка навыков аудирования и чтения; совершенствование лексических навыков; развитие навыков монологической речи. Оборудование: картинки и карточки со словами по теме продукты, специальные вопростельные слова, компьютер. - I'm glad to see you. Take your sits! 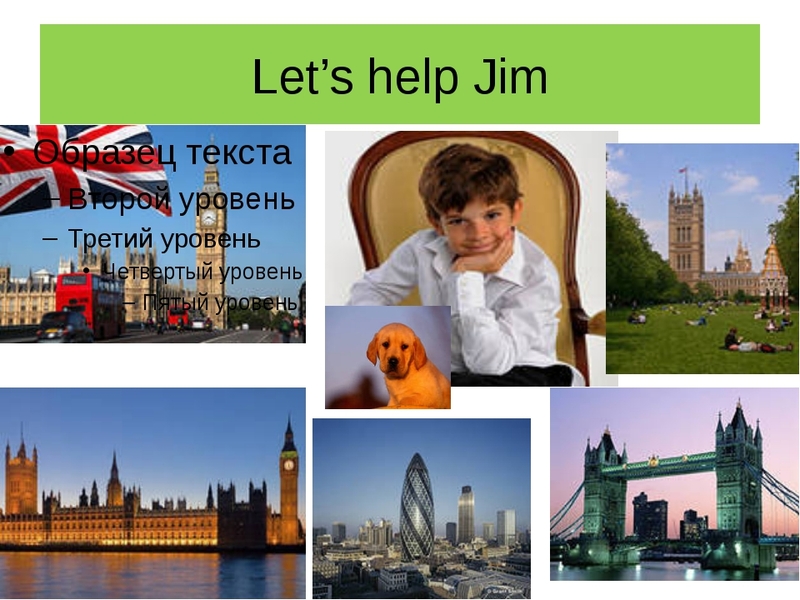 Today the theme of our lesson is " Let's help Jim". As you see the boy came from London. And he wants to know how Russian pupils speak English . He asks DOyou know English very well? You should be very attentive and work hard. He will give us some tasks and we should try to do them. - Let's begin our lesson with the preparing our toungs to the lesson. Look at the blackboard. 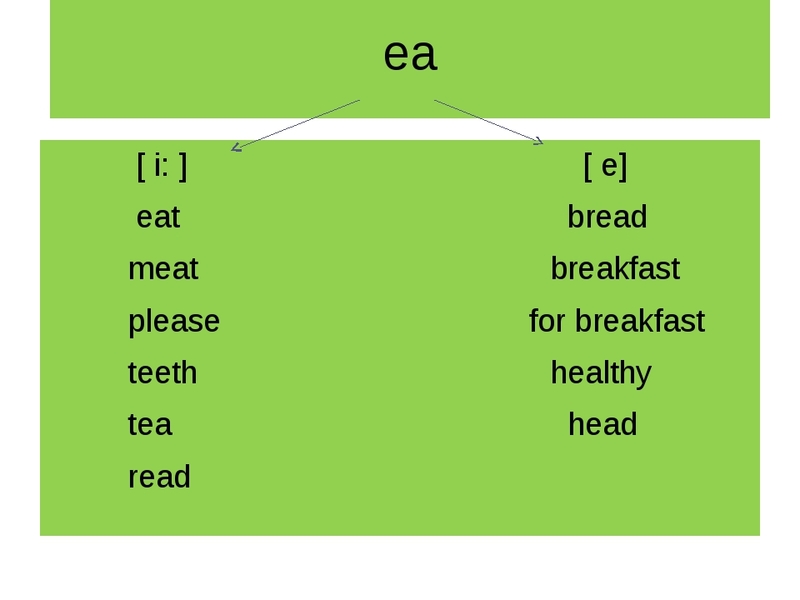 Here you can see the letters e and a (уф). this combination of letters give us two sounds. The first sound is [i:], the second sound is [e ]. Listen to me attentively and repeat after me. - Will you read the words ? Well done. Translate them. Raise your hands. 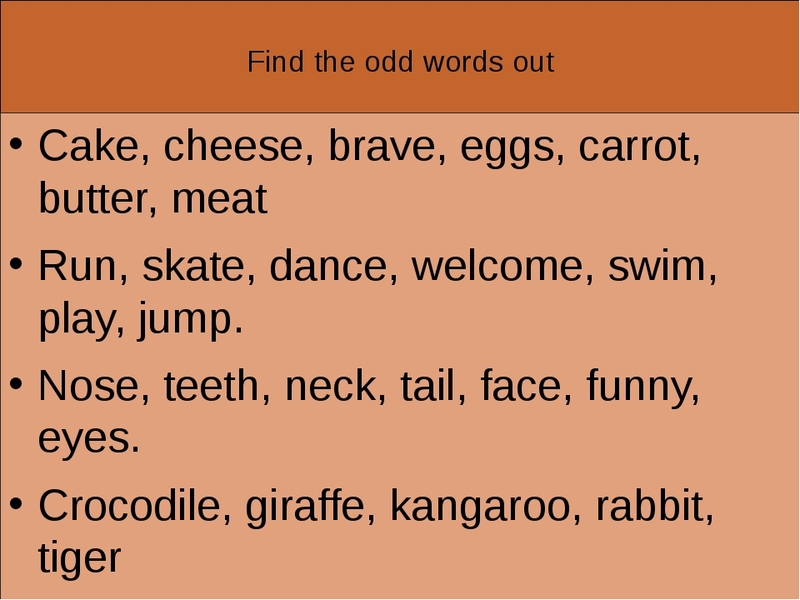 - It's time to play and find out what you like to eat for breakfast. I want 5 pupils to go to the teacher's table and choose the pictures. 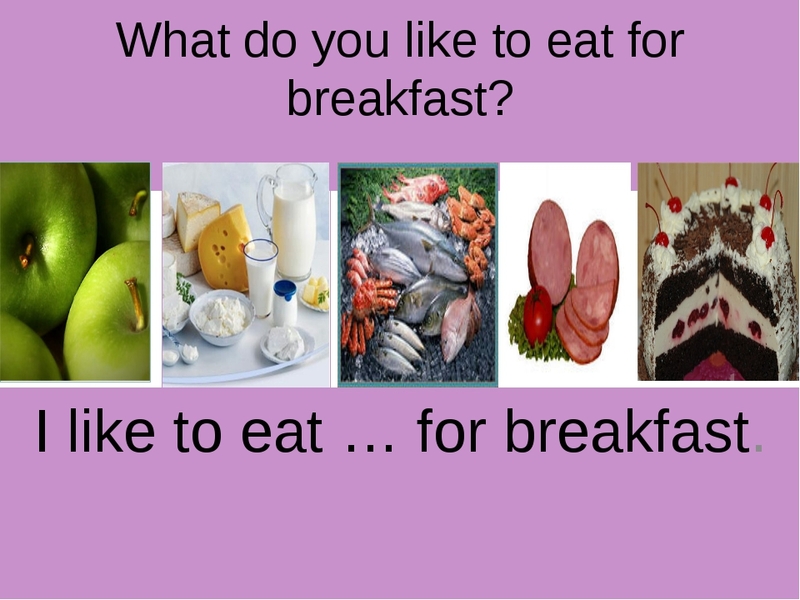 Other pupils ask them " What do you like to eat for breakfast?" and you should answer the question so like to eat ham for breakfast. 4) Тренировка навыков чтения и аудирования. Работа в парах. - Open your textbooks please! We shall read the dialogue from exercise 1 on page 35. Put the sentences in the logical order and make up the dialogue. I will give one minute. - Are you ready? Now listen to the speakers and check up yourself. -Have you got any mistakes? Who wants to read the dialogue? Will you translate? - Boys and girls Jim wants to tell some words about himself. but he can't. He can't read, because some words are fell down. Let's help Jim/ You should put the right words. Who wants to be the first? ( Translate the sentences). Do you agree with this variant? - We have read a little text about Jim and ask some questions! Can you tell Jim some words about yourself. He wants to know about yourself too. 7) Песенка " Неllo, hello!" - Let's have a little rest. Sing a song together. - As you see our guest jim has got a dog. Now, let's speak about animals! Look at the blackboard. 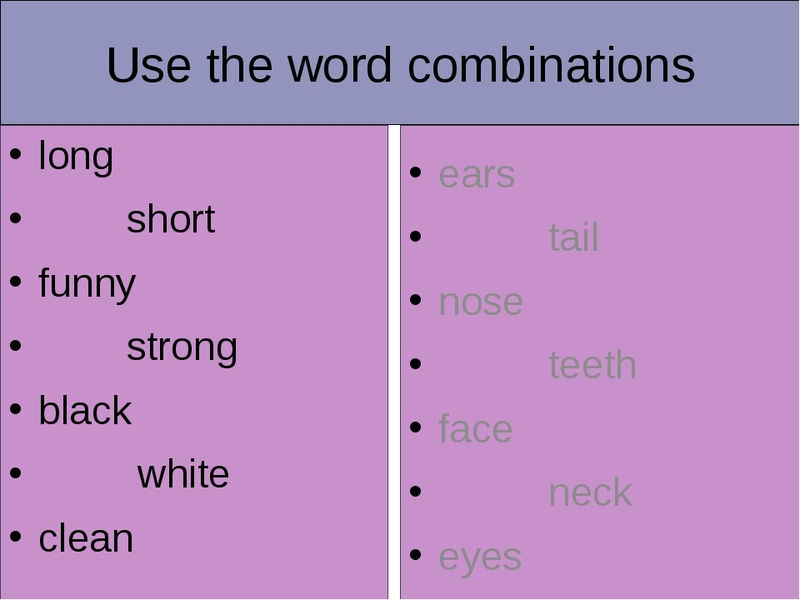 Let's help Jim to make up word combinations with this words. Are you ready? - Can you describe the picture? The bear has got short tail. the dog has got short tail. • Run, skate, dance, welcome, swim, play, jump. • Nose, teeth, neck, tail, face, funny, eyes.